When it comes to customer appreciation events, there’s no “one way” to go about it. Some managers like to have games and prizes ready for a day of fun. Others enjoy giving away donuts as a reminder of their appreciation. 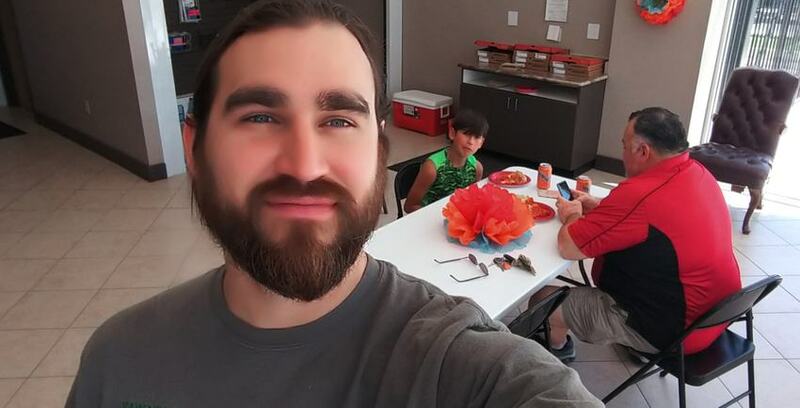 However, Lockaway Storage manager Jordan Ames decided that he wanted to show gratitude to his customers by throwing a pizza party at his facility – Lockaway Storage on Bandera Road. The event happened on July 3rd from 11:00 a.m. to 2:00 p.m. and was well attended. Jordan said that he wanted to give his customers something he knew would communicate how much Lockaway Storage appreciates their business. Pizza just seemed like the best way to do that. Jordan made sure to have a little bit of everything: cheese pizza, pepperoni pizza, supreme pizza, and even hawaiian pizza. Although, he said that the hawaiian pizza was really just for him. “I’m one of those weird people who likes pineapple on pizza,” he said. The community at Lockaway Storage on Bandera Road is a strong one with regulars according to Jordan, and some of the tenants who came to the party included families and musicians. This facility is host to a myriad of tenants such as business owners, students, families, musicians, and everything in between. Every one of those tenants bring something different to the community, and it is important to Lockaway Storage facility managers like Jordan to let each one know that their business is valued and appreciated. So next time you see a flyer for a customer appreciation day at any of our Lockaway Storagelocations, stop by to receive some well deserved love that might just be in the form of a delicious slice of pizza.